The second part of my Empath myths discussion! 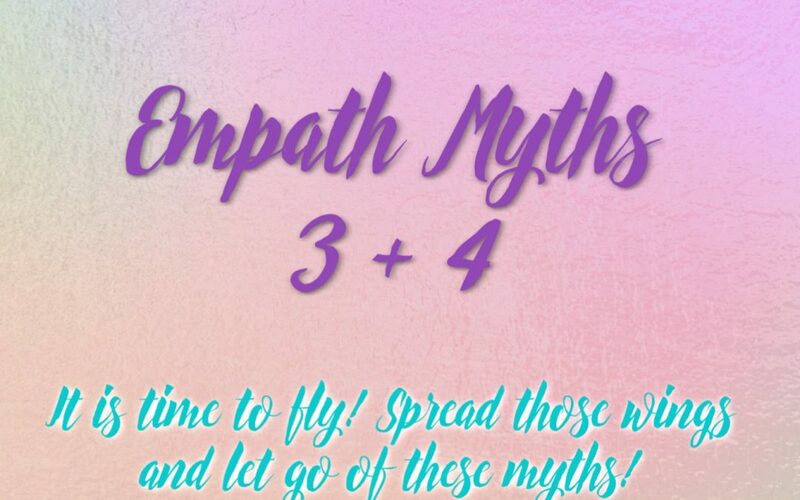 (Myths 1 and 2 click here) I want to dispel these myths so my fellow Empaths can gain the clarity and the insight to release what isn’t serving them. Because it is your time to fly! It is time to be fully embodied and fully expressed as the powerful one you are. Myth # 3: If you aren’t connected to others via the empathic cords you will lose your love and heartfelt connection to that person. Thankfully, this is NOT the case wonderful Empath! I know some of you feel that if you remove your energy from other people, you will lose connection entirely with them. Then what might happen? They might leave you? Or you won’t love them anymore? I know these fears and concerns run deep. I know it’s something to really feel into and do the inner work to release this paradigm that doesn’t serve you. It is so worth it because there is the freedom and deeper connection you desire on the other side of this. The connection you have with others WILL feel different because there is a sense of FREEDOM and you don’t lose yourself in it all. Powerful right? This is the work I do with Empaths because you are completely entitled to abundant freedom and love that feels powerful AND where you don’t lose yourself in the mix. Are you ready to love and connect from a place of freedom and power? I completely believe in you and I know you can have the freedom you desire. Myth #4: You can’t be amazingly intuitive without taking on other people’s stuff. I am here to tell you, YES YOU CAN! Do you feel this way underneath the surface? Because many lovely Empaths don’t know what it’s like to read someone’s energy without taking on their energy. It can feel one and of the same but guess what? You can be clairscentient and not function as an Empath. WOW! How about that? 1- You aren’t being affected by the other person’s stuff so you don’t have symptoms like drain, fog, mirroring others moods emotions or pain. 2- There is a feeling of being an observer instead of full on IN it. Which allows you to actually be clearer on what you are picking up or “reading” from the other person. 3- You can use your sense of feel in a way that doesn’t involve the empathic cord. So it’s feeling but it’s not the same as taking it on. Where are you with this? There are so many powerful Empaths and Lightworkers out there that really struggle with these patterns. It can be really frustrating and draining however there IS another way. I say this from a place of knowing what it’s like to be totally overwhelmed and taken over by other people’s energy. I’ve also seen it and helped my fellow Empaths move into more freedom and power with this too. It’s beautiful to see a powerful Empath Lightworker as the lighthouse and not the ship lost at sea!